This article is the 9th part of the tutorial series called Node Hero - in these chapters, you can learn how to get started with Node.js and deliver software products using it. In this tutorial, you are going to learn what is unit testing in Node.js, and how to test your applications properly. You can think of tests as safeguards for the applications you are building. They will run not just on your local machine, but also on the CI services so that failing builds won't get pushed to production systems. You may ask: what should I test in my application? How many tests should I have? The answer varies across use-cases, but as a rule of thumb, you can follow the guidelines set by the test pyramid. 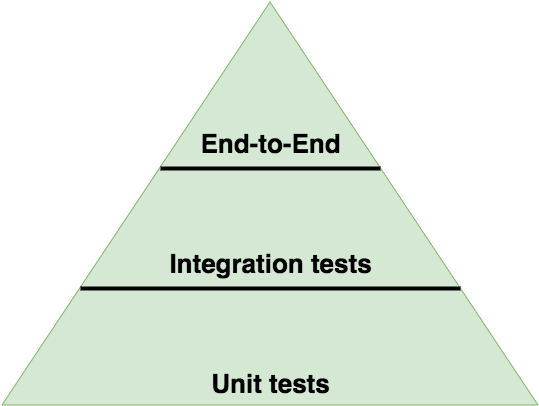 Essentially, the test pyramid describes that you should write unit tests, integration tests and end-to-end tests as well. You should have more integration tests than end-to-end tests, and even more unit tests. Let's take a look at how you can add unit tests for your applications! Please note, that we are not going to talk about integration tests and end-to-end tests here as they are far beyond the scope of this tutorial. We write unit tests to see if a given module (unit) works. All the dependencies are stubbed, meaning we are providing fake dependencies for a module. You should write the test for the exposed methods, not for the internal workings of the given module. Each unit test should test one concern only. (Of course this doesn't mean that you can add one assertion only). test spies, stubs and mocks: sinon (for test setup). Spies, stubs and mocks - which one and when? Before doing some hands-on unit testing, let's take a look at what spies, stubs and mocks are! You can use spies to get information on function calls, like how many times they were called, or what arguments were passed to them. Stubs are like spies, but they replace the target function. You can use stubs to control a method's behaviour to force a code path (like throwing errors) or to prevent calls to external resources (like HTTP APIs). A mock is a fake method with a pre-programmed behavior and expectations. As you can see, for mocks you have to define the expectations upfront. This module does one thing: it saves a web page (based on the given URL) to a file on the local machine. To test this module we have to stub out both the fs module as well as the request module. Before actually starting to write the unit tests for this module, at RisingStack, we usually add a test-setup.spec.js file to do basics test setup, like creating sinon sandboxes. This saves you from writing sinon.sandbox.create() and sinon.sandbox.restore() after each tests. Once we have these setups, it is time to write the tests itself! To get a better idea of how well your codebase is covered with tests, you can generate a coverage report. You can click around, and actually see your source code annotated - which part is tested, which part is not. Testing can save you a lot of trouble - still, it is inevitable to also do debugging from time to time. In the next chapter of Node Hero, you are going to learn how to debug Node.js applications . If you have any questions or recommendations for this topic, write them in the comments section.